Lexus decided in 2014 to offer compact-sized crossover called NX, as that was one part of SUV world where it didn’t have its player. Upper echelons were well covered with mid-sized RX and GX, while the full-size segment was occupied by LX. 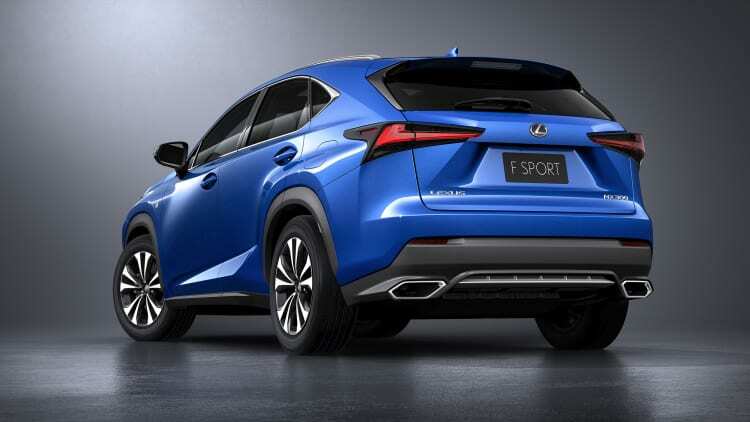 It has been three years since this model debuted, so Shanghai Auto Show just housed facelifted 2018 Lexus NX. NX already looks fantastic and fresh as it can get. This is becoming usual with latest Lexus’s products, and none of them appears to need any face lifting after several years on the market. Yet, when you see the changes, the car looks even fresher. Spindle grille is bigger, stretching all the way down, along with the new more intriguing pattern. Fog lights and side intakes are reshaped, while headlights have new LED configuration. At the back, rear lights are darker with slightly altered shape, and bumper’s plastic protection is styled differently. To sum up, the whole car is even more angular, sharper and more aggressive. Definitely, still, a visually most intriguing choice in the segment, while you can even go further with F-Sport package bringing black mashed grille and visible exhausts. The overall shape of the interior, sculptured as waterfall remains, while you can notice larger and more stylish infotainment screen, grown from 7 to 10.3-inches. Also, HVAC controls are simplified and made more elegant, while most of the switches, along with door handles and shifter have metallic satin finish now. The rest is the same, meaning it remains as one of best interiors in the class with carefully chosen materials and incredible quietness. So far you could choose between 200t and 300h model. The 300h model hides the same stuff under the hood as it uses the hybrid powertrain combining Atkinson cycle 2.5-liter I4 petrol engine and two electric motors. Total power output is unchanged at 197 hp and 155 lb-ft of torque, same as sluggish acceleration time of 9.3 seconds. Petrol offer dubbed as 200t becomes 300 model from now on, but don’t get too excited as besides name nothing changed. It is still turbocharged 2.0-liter I4 rated at 238 hp and 258 lb-ft and with 0-60 time of 7 seconds, which all sounds fair, but not special as the majority of rivals reach 60 mph faster. NX was luxurious, quiet, refined and comfortable compact SUV. But it wasn’t fun to drive. Ability to soak road imperfections was sublime, but it was totally at the expense of a driving joy. We know that many latest Lexus’s products learned how to corner and in the skillful manner that is, so finally NX is getting its dose of nimbleness. There was some fiddling and meddling with springs, stabilizer bars, and bushings, while shock absorbers are brand new and you can even opt for adaptive suspension, the same one as in new LC500, and according to Lexus’s statements, its biggest flaw is well diminished by this. More than ever. 2018 Lexus NX ask for $36k for a start, and it represents complete package now. It is even better looking, the cabin is even more refined, infotainment screen is significantly larger, but none of that was essentially necessary. Yet, better driving dynamics was something that we all yearned for, and despite acceleration time remained unspecial, we will mark it as a complete package since you won’t be able to find any significant flaw with it.